The Dracaenaceae is a group of about 160 species of tropical trees, shrubs and herbs in the monocotyledonous genera Dracaena and Sansevieria. 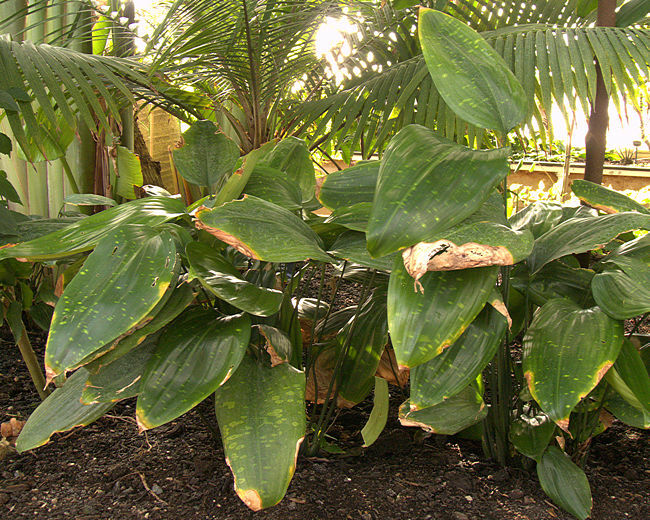 The Dracaenaceae were formerly included in the Agavaceae. Separation into their own family is not universally accepted. 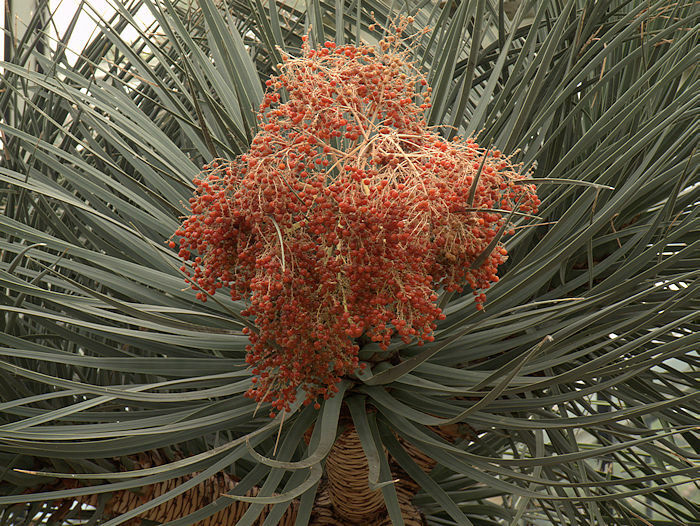 Some classification systems include members of the Nolinaceae and Cordyline in the Dracaenaceae or Ruscaceae. 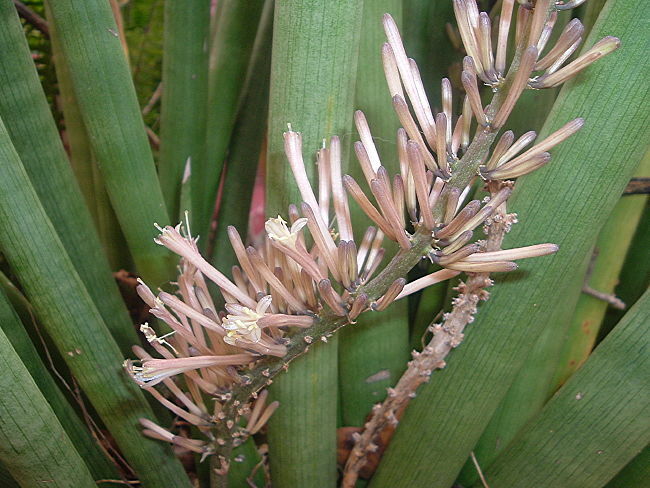 Plants in the Dracaenaceae usually have linear, parallel-veined, fibrous, semi-succulent to succulent leaves arranged in rosettes with a pachycaul, woody supporting trunk (Dracaena) or with a short stoloniferous stem (Sansevieria). 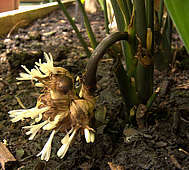 Dracaena generally have orange roots, distinguishing them from Cordyline which have white roots. Leaves of many species contain irritant calcium oxalate crystals and the sap may contain saponins. 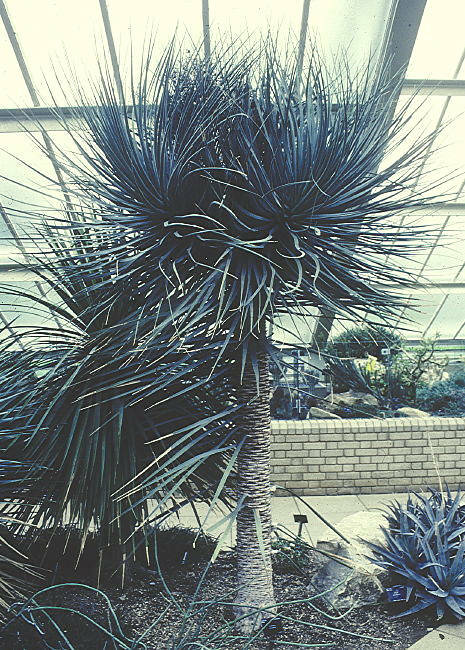 Dracaena have a secondary thickening meristem in their trunk known as Dracaenoid thickening and shared with some related families. are distributed through the Canary Islands, Madeira, Cape Verde Islands and Morocco, tropical Africa, a few in Asia and one species in South America. There are probably around 60 species including succulent trees with stiff leaves from arid areas and smaller shrubby plants with flexible broad leaves growing on the floor of rain-forests. The fleshy roots are usually orange. However, numerous synonyms and cultivars are known, confusing the real number of species. 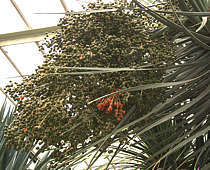 Flowers carried on racemes or pannicles are followed by red or orange berries. 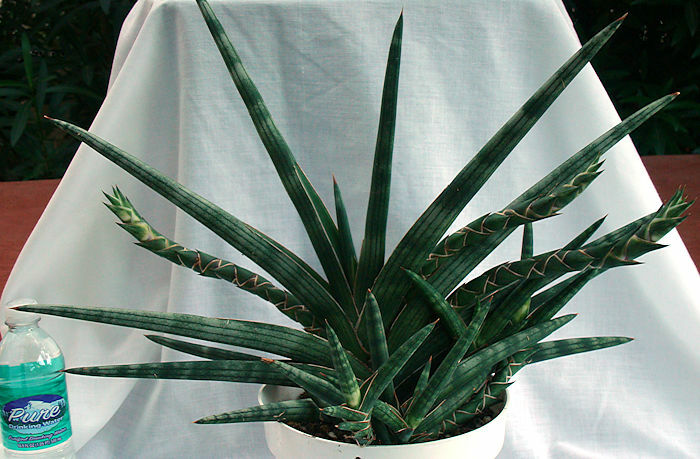 Dracaena is closely related to Sansevieria. These tough succulent plants are frequently seen decorating shopping malls and offices and are popular as undemanding house-plants. However, they are not frost hardy. 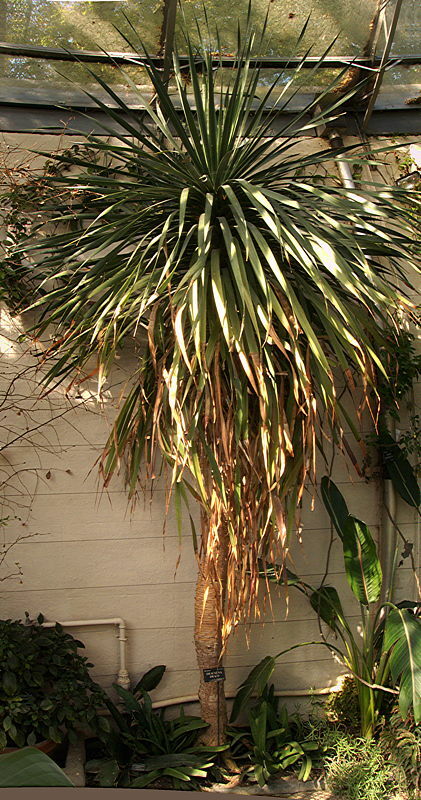 A dark-leaved species Dracaena marginata (Red Edged Dracaena) seems to be particularly popular with interior designers at present and is replacing the once-ubiquitous Yucca elephantipes. 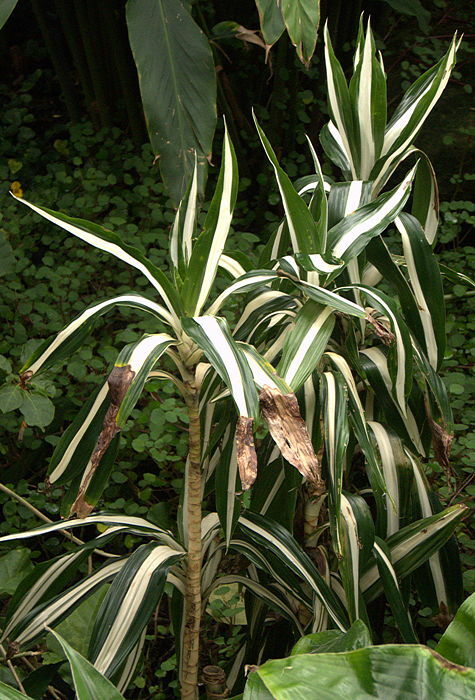 Some Dracaenas are sensitive to fluoride, which causes leaf chlorosis. Watering with fluoridated water should be avoided. A new species of Dragon's Blood Tree Dracaena kaweesakii (Wilkin & Suksathan, 2013) was discovered in the mountains of Thailand in 2013 although it appears to have been cultivated in the grounds of Buddhist temples for some time. It grows to 40ft in height with extensive branching. Dragon's Blood The stems of Dracaena trees especially Dracaena cinnabari from Socotra and Dracaena draco from the Canary Islands, exude a reddish sap (Dragon's Blood) containing spirit-soluble resins, from cracks in the bark of the trunk. Resin collectors assist the process by enlarging the cracks. Pliny the Elder believed that the Dragon Tree sprang up after a fight and mingling of blood between an elephant and a basilisk (dragon). Dragon's Blood was used in the classical to medieval period in magic, alchemy and in medicine as an astringent. Unfortunately, there was some confusion with the bright red poisonous pigment cinnabar (mercuric sulphide). Dragon's Blood is used in coloured varnishes and other products and was an essential ingredient for varnishing 18th century Italian violins. 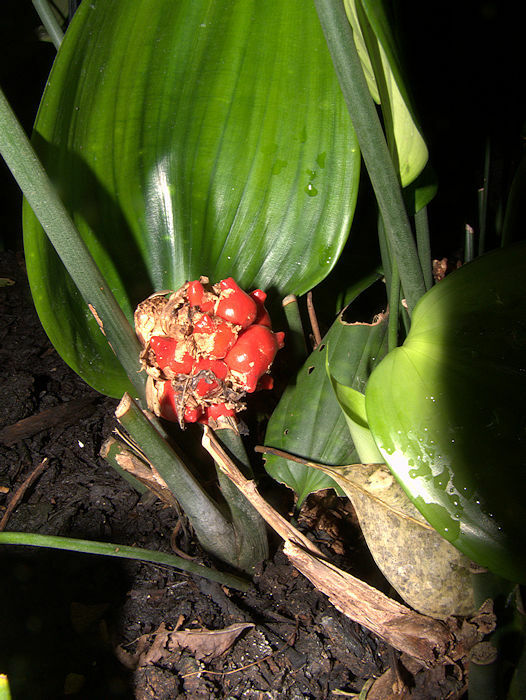 Dragon's Blood from Dracaena cochinchinensis is a remedy in traditional Chinese medicine for stomach ulcers, blood clots and for closing wounds. 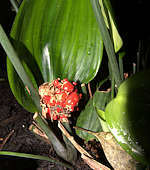 Resins from several other plants, especially the bark or fruit of the Rattan Palm Daemonorops draco syn. 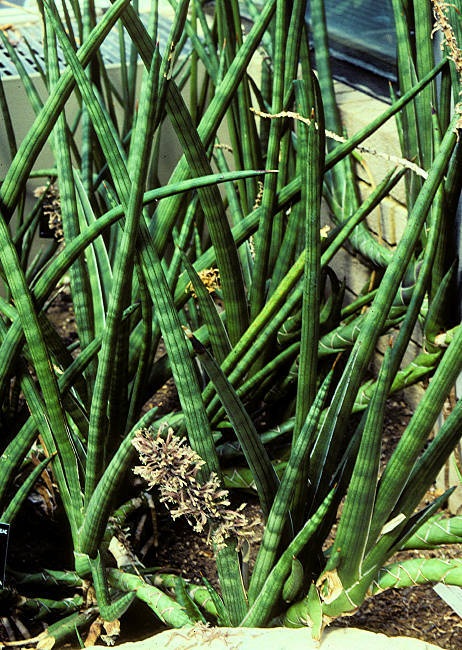 Calamus draco, and from South American Crotons, are also marketed as Dragon's Blood, but with different chemical and other properties from the "original". Caveat emptor ! 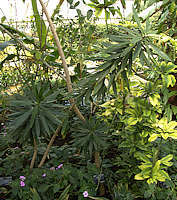 a substantial tree from South Africa and Swaziland growing to 15 ft. Rosettes of curved, leathery, strap-like leaves are carried on the end of a stout, branching light-brown trunk patterned with leaf scars. The inflorescence is a panicle of small sweetly perfumed yellow-green flowers produced during the summer, and is followed by orange berries. is widely distributed across equatorial Africa. 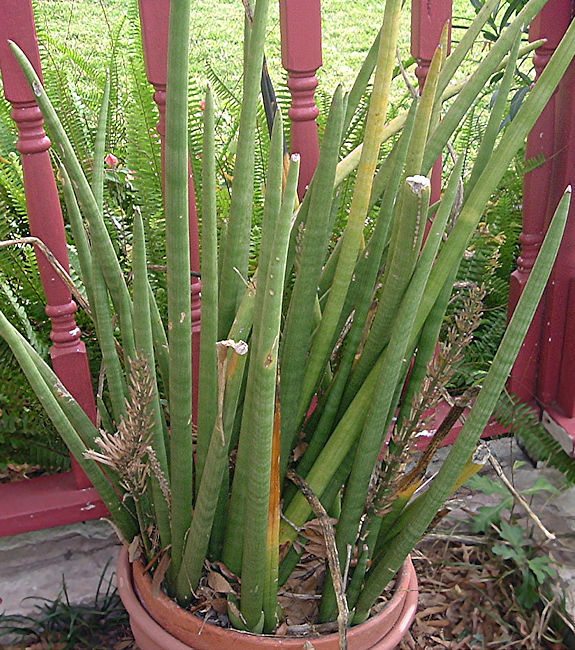 Long, ribbed, sword-shaped leaves on short stems arise in clumps from the soil. 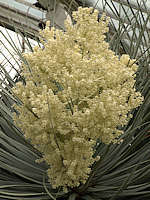 The tassel of white flowers is slightly fragrant and followed by bright orange berries. a shrubby plant from equatorial Africa growing up to 20 ft tall. 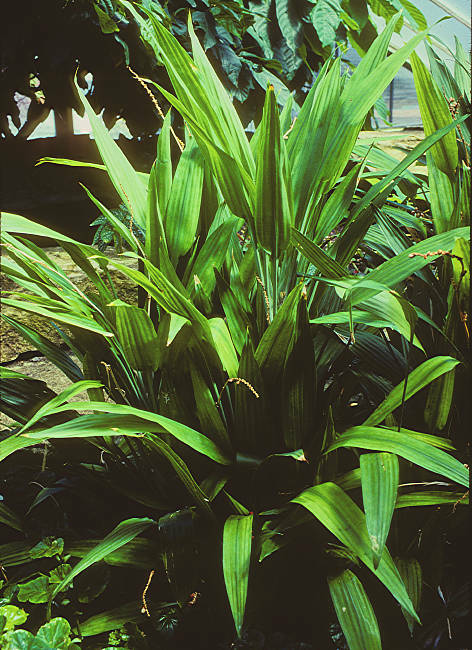 Cane-like stems rising from the rootstock bear whorls of sword-shaped leaves. Pendulous tassels of white flowers are produced at the stem joints. This classic Dragon's Blood Tree of Socotra was known to the Romans as the source of Dragon's Blood, although formally described later. In their habitat, old trees adopt a curious mushroom-like shape with the 20ft trunks dividing after each flowering to produce many heads of narrow, leathery glaucous-blue leaves forming a dense crown. The inflorescence is a branched panicle of small, fragrant, greenish-white flowers, followed by orange cherry-sized berries. The trees grow best in regions experiencing mist and low clouds. Although not uncommon, they are reported to be regenerating poorly, but perhaps such ancient slow growing trees experience infrequently suitable conditions for propagation. This species has a trunk up to 40ft tall, supporting an umbrella-shaped canopy of rosettes of stiff sword-shaped 2ft leaves. The trunk branches dichotomously after flowering, which takes at least ten years. 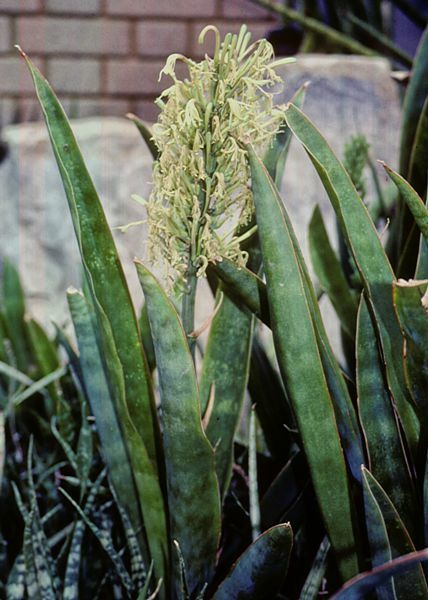 The inflorescence is a terminal panicle of greenish-white flowers, followed by round reddish-orange fruits. 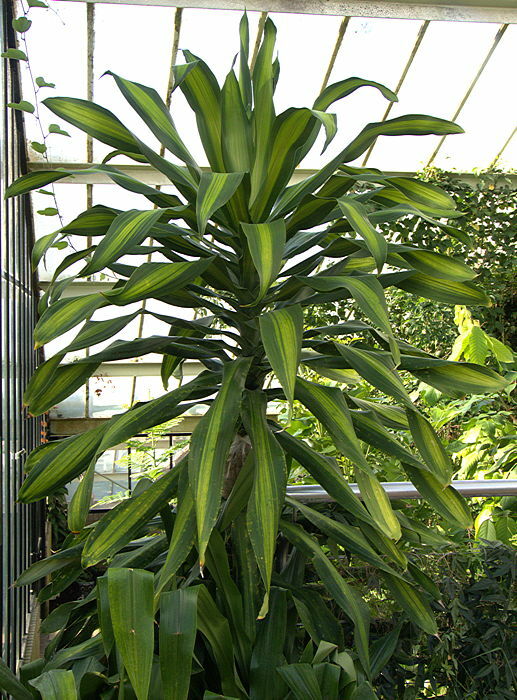 Dracaena draco is native to the Canary Islands (subspecies draco), Cape Verde, Madeira and Western Morocco (subspecies ajgal). Although endangered in its habitat, the tree is widely cultivated as a drought-resistant sculptural tree which tolerates light frosts. The trees grow slowly, but are very long-lived. 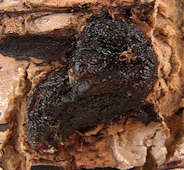 A reddish resin, Dragon's Blood, exudes from damaged bark and was used in Mediaeval alchemy, embalming, varnish for e.g. Stradivarius violins, incense and in traditional medicine. 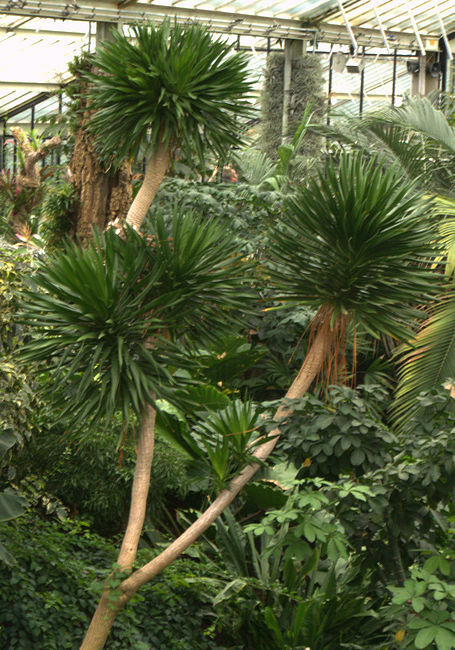 Left: Princess of Wales Conservatory, RBG Kew. Extreme left: Oxford University's Botanic Garden. 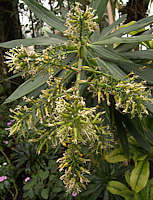 Draceana fragrans becomes up to 50ft tall, usually developing a shrubby habit with multiple stems from the base. 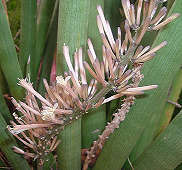 After flowering the stem branches to form a crown of thin branches. 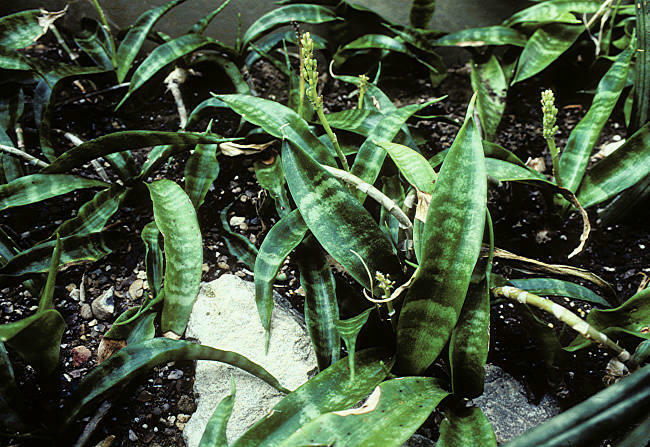 The glossy-green lanceolate leaves develop a central pale green longitudinal stripe in bright light. The inflorescence consists of panicles of fragrant one inch diameter pale pink to white flowers, followed by orange berries, each containing several seeds. Flowering is rare indoors but cool dark nights may induce flowers. Native to tropical Africa from the Ivory Coast and Angola to Sudan and Mozambique, growing at elevations up to 7000ft. Often used for hedging within its native range and as popular foliage plants. 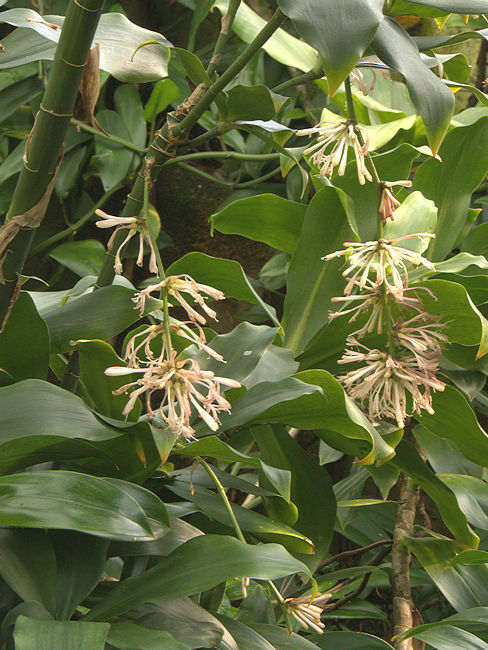 There are several variegated cultivars of D. fragrans. D. deremensis is a synonym of D. fragrans. This selected cultivar has a white stripe down the middle of the leaves. 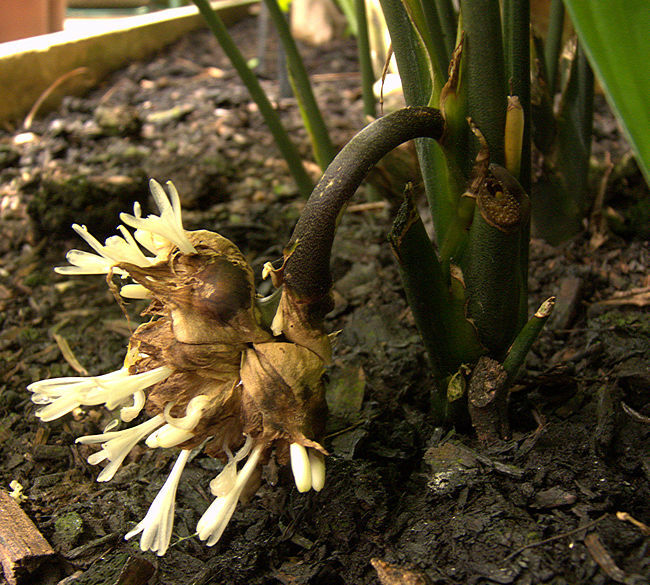 The fragrant white flowers may be induced by chilling the plant. Named for: Reverend Hugh Goldie, who collected a specimen for the Edinburgh Botanic Garden in 1870. This is a small, shrubby plant, growing up to 8ft tall and sending several unbranching stems up from the root. The rounded, dark green leaves with pronounced pointed tips, are attractively marked with silver transverse bands on their upper surface. 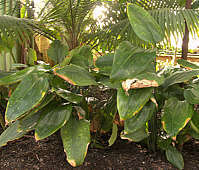 Native to West Africa including Nigeria and cultivated in many tropical countries as a foliage plant. is native to tropical West Africa. Short stems arising from the rootstock carry oval, ribbed leaves which are attractively spotted. The inflorescence is an insignificant clump of flowers within a cup formed from bracts and on a short stem close to the roots. The flowers are followed by glossy red berries. This Dracaena may grow 20ft tall with a stem that is relatively thin for it's height, but is commonly seen as a much smaller house plant. Tight whorls of lanecolate dark green leaves are arranged spirally around the upper portions of the knobbly stem. 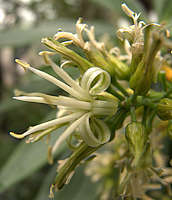 The inflorescence is a branching cluster of small white flowers. Native to Madagascar, Mauritius and nearby islands. Selected cultivars include variegated forms. Herbal teas made from the leaves and bark are used in traditional medicine. This 20ft tree produces several unbranching stems patterned with diamond-shaped leaf scars. The narrow dark green leaves have reddened margins and taper to pointed tips. 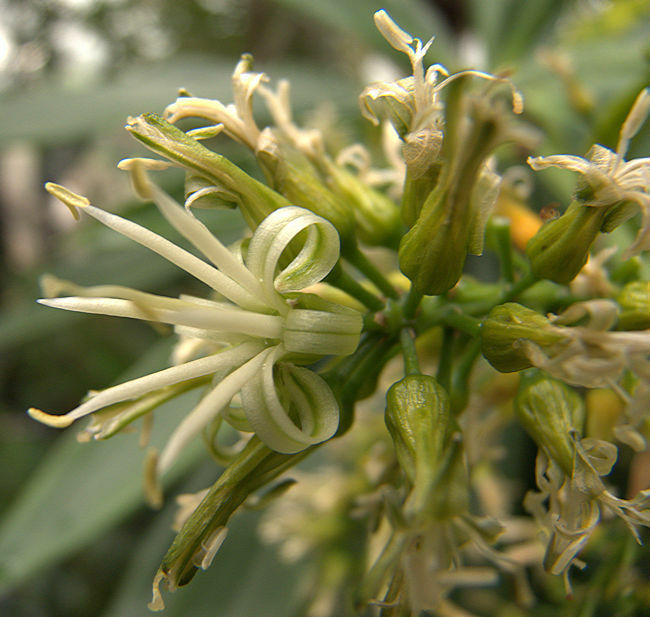 Long racemes of fragrant white flowers are produced in Spring, followed by orange berries. 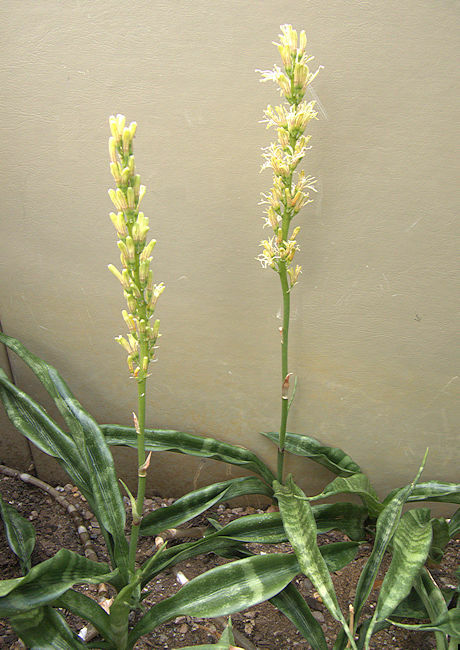 However, flowering is rare on plants kept indoors. Native to Madagascar. 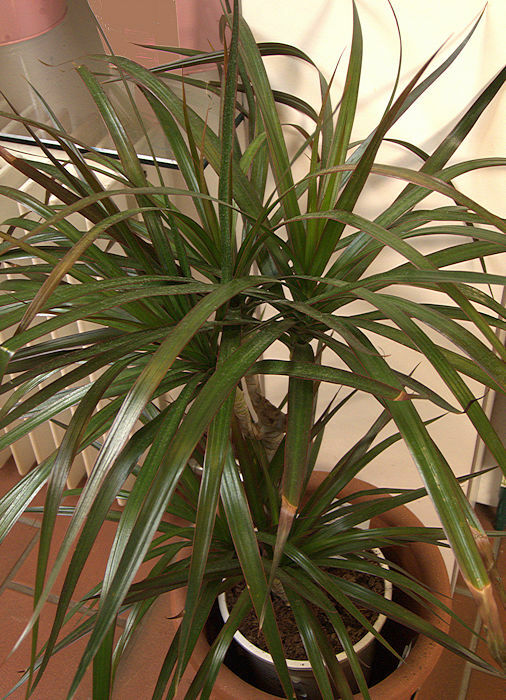 Usually seen with the synonym Dracaena marginata as a tolerant indoor foliage plant although it dislikes low humidity. Spray the leaves with water to avoid brown tips. Also avoid fluoridated water. While tolerant of shade, the best foliage colouration will be obtained in strong diffuse light. Can bef propagated from stem cuttings. The cultivar "tricolor" has an additional yellow stripe along its leaves. A tree with a cluster of leathery, narrow, tapering blue-green leaves on a substantial trunk with pale bark patterned by leaf scars. The trunk branches dichotomously near to its top. 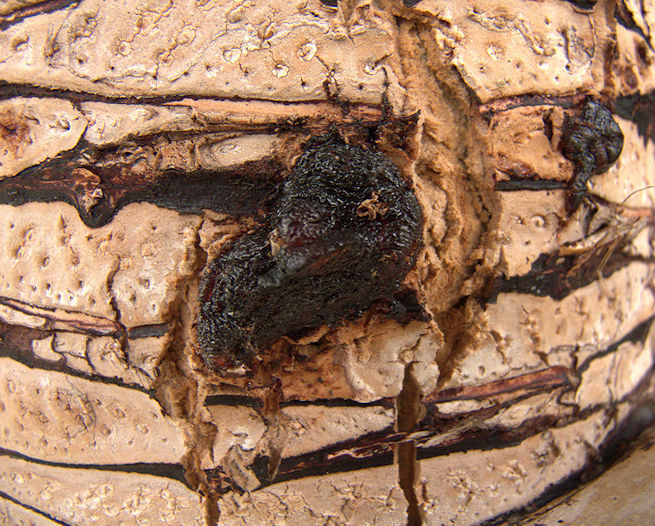 Right: The red resin of Dracaena ombet expressed through cracks in the bark and hardening on the surface, is used in traditional medicine. The panicle of small white flowers (bottom left) is followed by a cluster of orange berries (below). 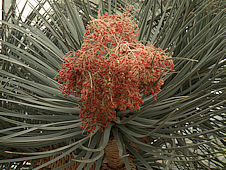 Native to Ethiopia, Eritrea, Sudan and Somalia where the synonym Dracaena schizantha (Baker 1877) was applied until recently. from Cameroon forms a small 5 ft tall shrubby plant. 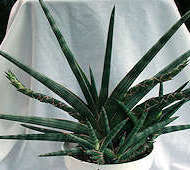 Multiple stems arising from the rootstock carry dark green or variegated sword-shaped leaves, depending on the cultivar. 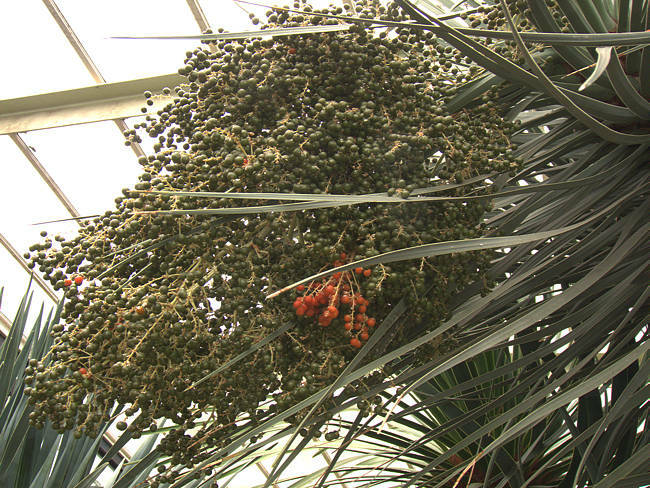 Dracaena sanderiana is widely marketed as "Lucky Bamboo," although unrelated to the bamboo (grass) family. The canes are grouped together or twisted into a spiral or other fancy shapes under the influence of directional illumination and gravity. They root easily in water surviving for a long time this way, even with poor illumination. However, they really need to be planted in soil and given bright light to make a satisfactory plant. 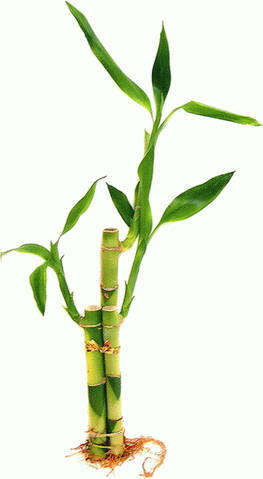 "Lucky Bamboo" is popular with Feng Shui practitioners, but being an African plant, is presumably a recent addition to the game. a shrubby multi-stemmed tree up to 45 ft tall. Tapering trunks with pale brown bark arise separately from the rootstock and may branch occasionally. They bear terminal clusters of large sword-shaped, ribbed green leaves. The inflorescence is a panicle of many small greenish-white flowers followed by a cluster of reddish-purple fruit. Native to tropical East Africa from Mozambique and Zimbabwe to Ethiopia, typically growing at the edges of evergreen forests. Succulent plants from this genus are distributed across tropical Africa. 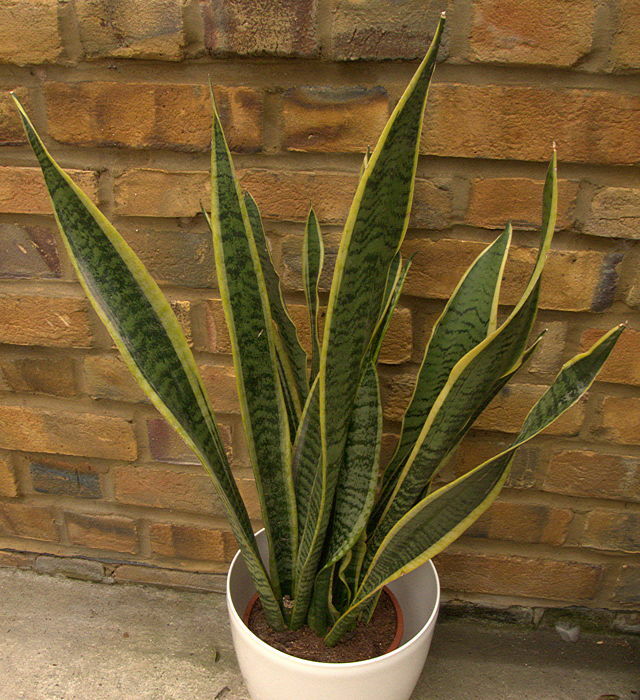 Their tough strap-like leaves are resistant to abuse and neglect and the unusual leaf form of species such as Sansevieria cylindrica (South Africa / Natal) makes them popular as architectural plants with trendy designers. A large number of variegated forms are known. 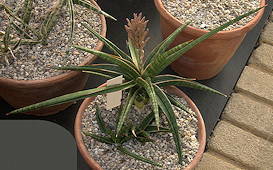 Some of these plants tolerate central heating and poor light very well, making them ideal succulent house-plants. However, bright light will bring out the best in them and encourage flowering. 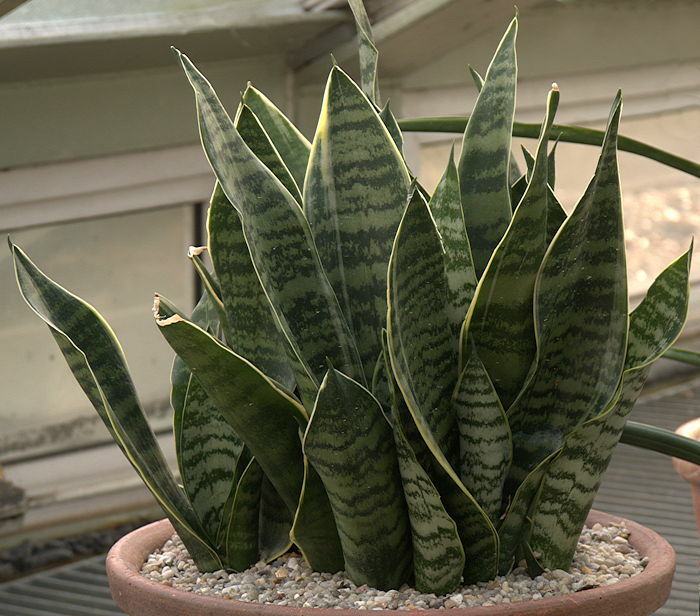 The leaves of Sansevieria kirkii var. pulchra takes on an attractive bronze colour in full sun. A selected cultivar Sansevieria pulchra cv. Coppertone has bronzed leaves irrespective of light intensity. 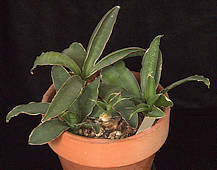 Sansevierias may be propagated by dividing the plant. Divide the fleshy rhizomes with a clean, sharp knife to separate offsets. Allow to dry off for a few days. Then pot up in a gritty free-draining potting mixture. Don't plant the cutting any deeper than in its original position or the base may rot. If necessary, use small stones or stakes to keep the cutting upright until it has rooted properly. Water sparingly until some growth is observed. 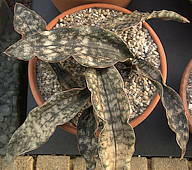 Sansevierias may also be propagated from leaf cuttings, but this takes a long time and cultivar-specific variegation may be lost. The rhyzome produces a clump of wide, flat lanceolate green leaves with paler green blotches or striations and brown margins. 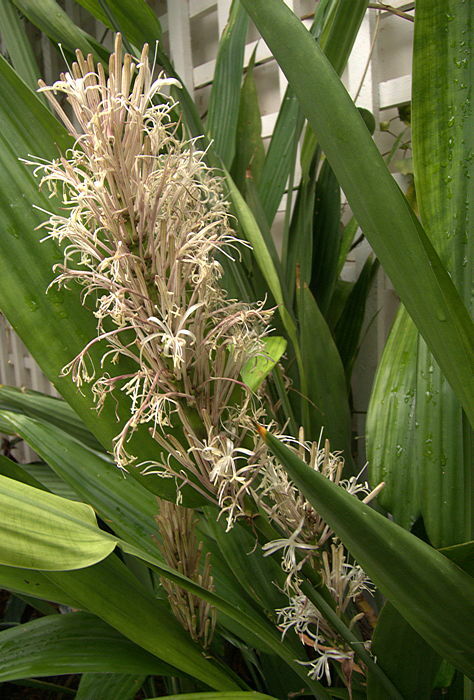 The inflorescence is a raceme of greenish-white flowers. Native to coastal scrub of Kenya, Tanzania and Malawi. 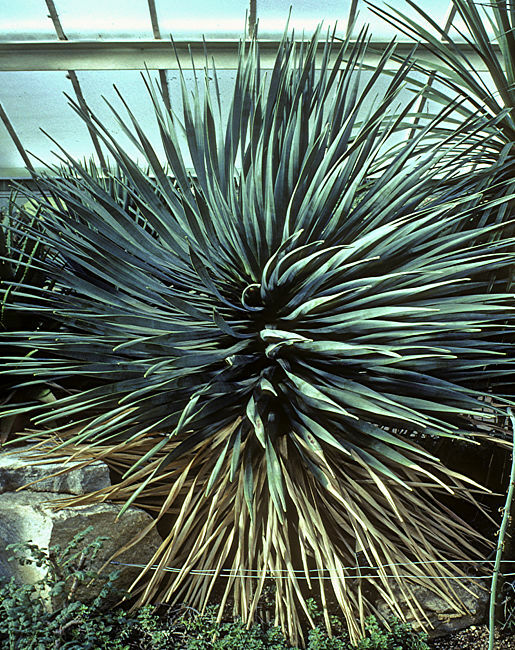 The rhyzome of this succulent plant produces a fan of cylindrical light green leaves tapering to a sharp tip and with longitudinal grooves and faint circumferential banding in a darker green. The inflorescence is a raceme of tubular pale pink flowers. Native to Angola and Zambia. Name: Latin gracilis = thin, slim, referring to the leaves. Erect stems have up to twelve recurved, inrolled light green 2 ft leaves arranged spirally. The leaf surface has darker narrow transverse bands and longitudinal lines. The plant spreads via aerial or subsurface stolons, eventually forming mats of leaves. Native to dry bushland of Kenya and Tanzania. Cultivated plants tend to leave their pot as the stolons grow outward. 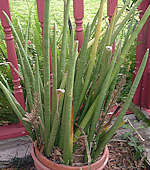 A more gracile form of Sansevieria gracilis. Native to Kenya and Malawi. Named for: Dr. John Kirk, part of Dr. David Livingstone's 1858 Zambezi expedition. A fleshy rhyzome produces clusters of up to three broad lanceolate dark-green leaves with wavy reddish-brown edges, pale brown drip-tip, surface mottled or banded in a paler green and with three to nine vertical darker lines. The leaves take on an attractive bronze colour in full sun. Native to coastal margins of Malawi, Tanzania and Zanzibar. 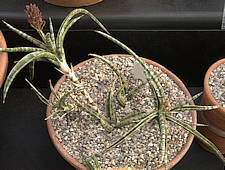 A selected cultivar Sansevieria pulchra cv. Coppertone has bronzed leaves irrespective of light intensity. 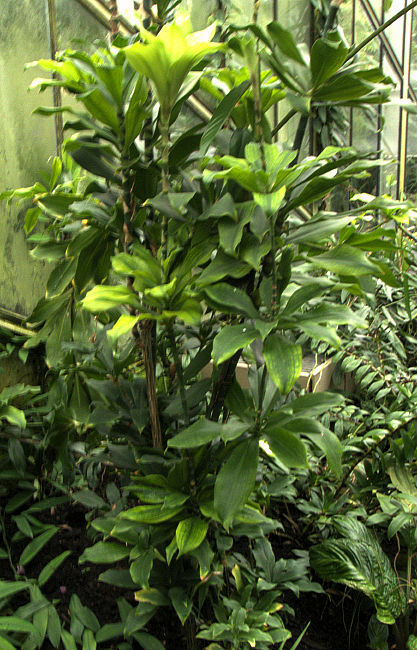 The orange rhyzome produces short, wide lanceolate leaves with dark-green / light-green banding. 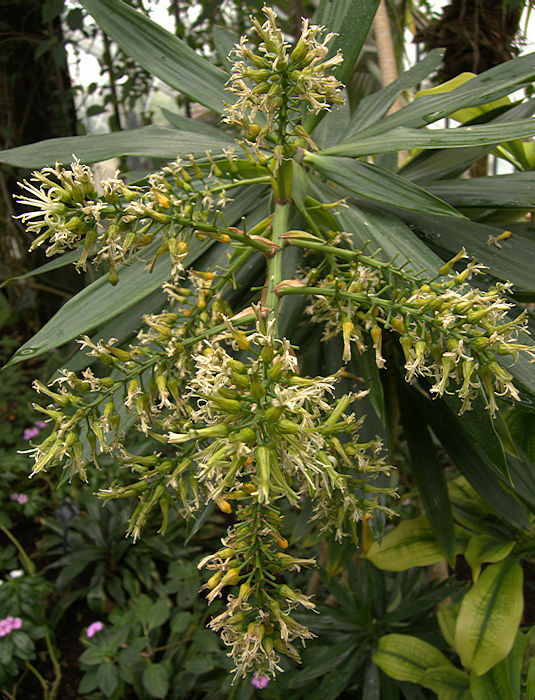 The inflorescence is a raceme of greenish-yellow flowers. Native to Kenya and Uganda. This plant may be a hybrid S. subspicata x S. trifasciata. The dark-green leaves have reddish edges and green drip tips. The succulent cylidrical leaves have a deep groove on the lower third of their upper surface. Leaves are circumferentially banded with light-green / dark-green, longitudinally grooved and terminate with a brownish sharp tip. 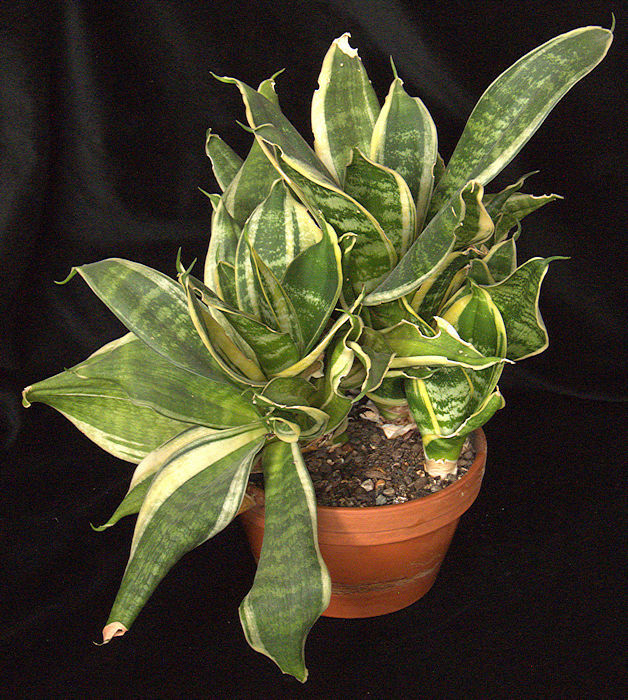 This is a sport of Sansevieria trifasciata with a mottled green leaf surface, prominent golden margins and an elongated drip-tip. 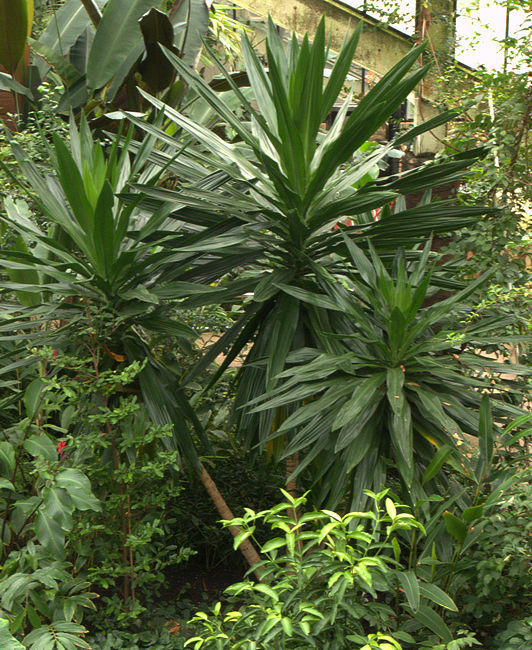 All the plants in existence originate from a single clump discovered by Laurent in a garden in the Belgian Congo. Native to tropical West Africa from Nigeria to the Congo and widely grown as an ornamental plant. 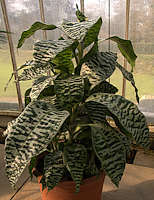 Plants should be propagated as rhyzome cuttings to preserve the variegation. The leaves can be processed to make bowstring hemp, a tough fibre. 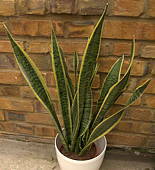 This is a selected compact sport of Sansevieria trifasciata. 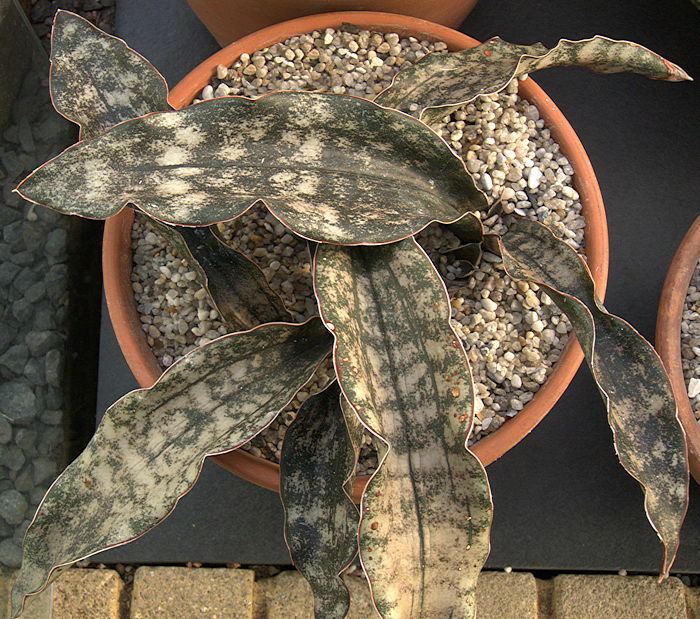 Various named forms of 'Futura' with variegation or golden leaf margins are in cultivation. Named for: Sylvan Frank Hahn, nursery owner who patented this cultivar. 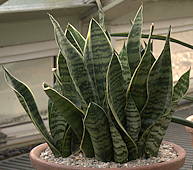 This is a selected sport of Sansevieria trifasciata with a compact habit but retaining the mottled green leaf surface, golden margins and an elongated drip-tip. It was discovered in 1939 in a plant nursery in Louisiana. An all-green form is also in circulation. Native to tropical West Africa from Nigeria to the Congo. 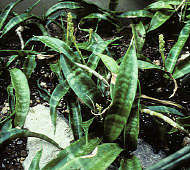 Plants should be propagated as rhyzome cuttings to preserve the variegation.